A retinue of monks which has traveled from Kyoto to Shikoku enters Sanuki Province and visits an old battlefield, Yashima Bay, where the Genji and Heike clans fought. As dusk gathers, they meet an old fisherman who is on his way home to his salt-baking hut on the beach. The old man once declines the request of the monk to offer them overnight lodging as it is a shabby hut. .However, because the old man misses the capital city, he changes his mind and offers them lodging when he hears that the group has traveled from Kyoto. 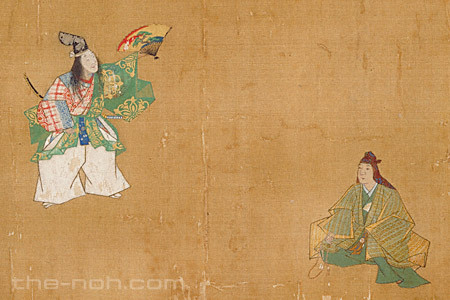 Encouraged by the traveling monk, the old man starts to vividly depict the battle fought between the Genji and Heike clans. 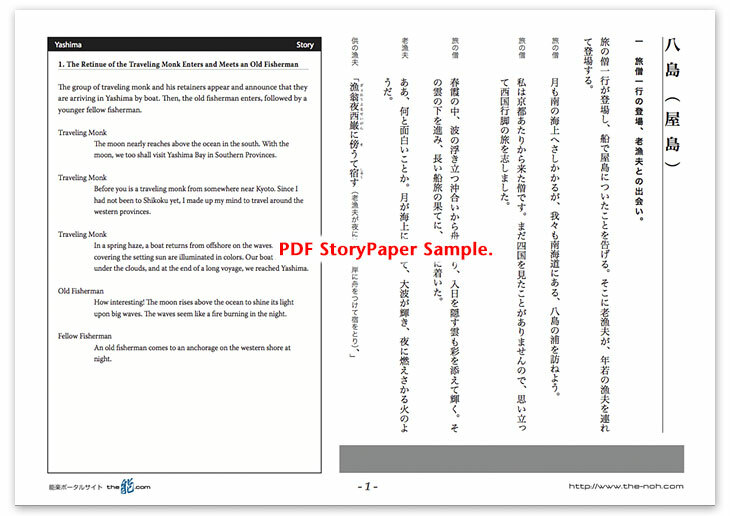 He describes the bravery of the General Minamoto no Yoshitsune and the famous battle in which two warriors pulled each other grabbing the other’s helmet neck protector. When the wondering monk asks the old man’s name, he implies that he is the ghost of Yoshitsune and disappears. When the monk naps while he waits a dream in the middle of the night, the ghost of Yoshitsune appears in armor and helmet. The ghost mentions that although he managed to drop his bow in the ocean during the battle at Yashima, he did not hold his life dear and put him at risk before his enemies to grab the bow and save his reputation. While he further describes life in the realm of asura where he is driven to fierce battles, the day starts to break. The monk awakens from the dream, and the ghost of Yoshitsune disappears in the white waves, voices of seagulls, and winds blowing on the beach. Minamoto no Yoshitsune, the highly-favored historic figure, is the leading character of this drama. He appears as a master warrior who descended into the realm of asura after his death. The world of asura is the place where wars and conflicts continuously occur, based on the cosmic view of Buddhism that creatures are incarnated in six different worlds. One of the six worlds is that of asura where the person who fought wars in life descends and suffers from being forced into endless fighting. While “Yashima” describes daunting and vivid war scenes, it mingles the bloody scenes with a beautiful scenery of long, peaceful spring night and the passing of time from evening gloom with the hazy moon to clear, brisk dawn. The settings in this story stand out vividly. This drama is classified into kachi-shura(-mono), in which the leading character expresses the victory of war and bravery, strength, and strictness are consistently described throughout the drama. Entangled with these elements are various emotions, including a samurai spirit, which a man is willing to risk his life for fame. All these elements together create the unique atmosphere of this drama.